And it’s so strange to think about Yeats lacking inspiration or feeling disappointed. It’s so strange to think about him looking back on his career with any kind of sadness or regret, or looking into his heart and feeling despair or disdain for what he finds there. I want to tell him what Isaac would tell him, that those old kettles and bottles and bones aren’t junk, they’re art materials. He can make himself a new ladder out of old iron and broken cans, a ladder that might be more true and stronger than his old one. But of course he knows that, he knows it all, because he found his inspiration, he wrote this poem, and it’s beautiful and he must have felt that in his deep heart’s core. I’ll blame it on the weather, on the seemingly endless winter, but I’ve wanted to make warm comforting bready meals lately. Last night it was this savory cake, which is a lot like a pizza with the toppings baked right into the dough. I made the dough rich and tender, with butter, milk and an egg (I think of it as brioche-like). And I filled that with my favorite combination of chard and mushrooms. I used pecans and pistachios, but you could use one or the other, whichever you have. 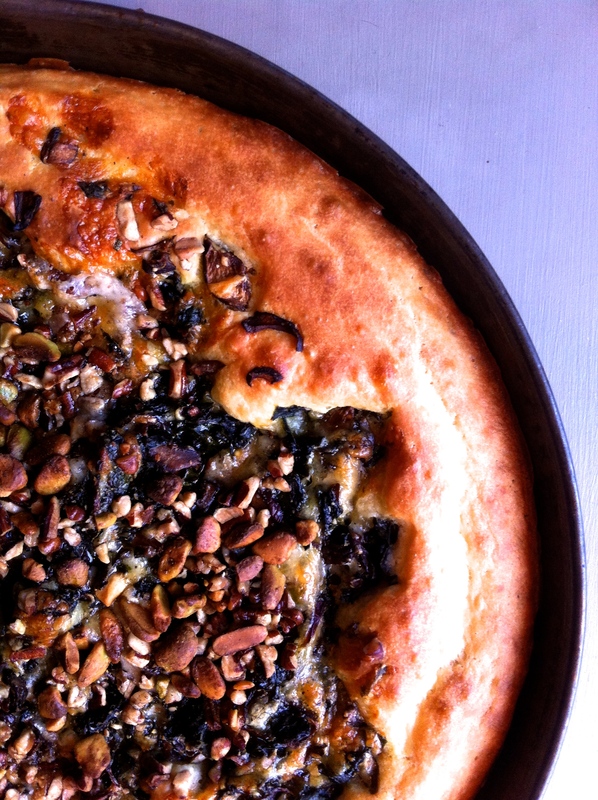 We ate this with leftover asparagus pesto and with a pecan sauce something like this one. In a large bowl combine the yeast, sugar, milk and butter. Leave in a warm place (like the oven on proof) till the yeast gets foamy and the butter gets very soft. Mix everything together, squishing the butter against the side of the bowl to be sure it gets mixed in. Add the flour and salt, and stir to combine. Beat in the egg and enough warm water to make a very thick but stirable batter, maybe another half cup or so. Leave in a warm place for about an hour or an hour and a half. Preheat the oven to 425. Toss the mushrooms with the olive oil and spread in a single layer on a baking tray. Roast for 20 – 25 minute until they’re crispy and dried out. Stir them frequently so the mushrooms on the edges don’t burn. Meanwhile, warm the olive oil in a large skillet over medium heat. Add the garlic and rosemary, stir and cook for a minute or two, add the chard and cook until it’s wilted but still bright. Season with salt, pepper and a dash of balsamic. In a large bowl mix the chard, mushrooms and cheese. Generously coat a large cake pan with olive oil. Pour the batter into the pan, leaving about 1 or 2 T in the bowl. In the same bowl mix the chard, mushrooms and cheese with the leftover batter. Pour this mixture into the center of the cake, spreading it slightly with a spoon or fork, but leaving about an inch margin all around. Sprinkle the nuts over the center. Let the cake sit for about fifteen minutes, and turn the heat up to 450. Bake for 20 – 30 minutes, until the crust is puffed and golden brown and pulling away from the pan. 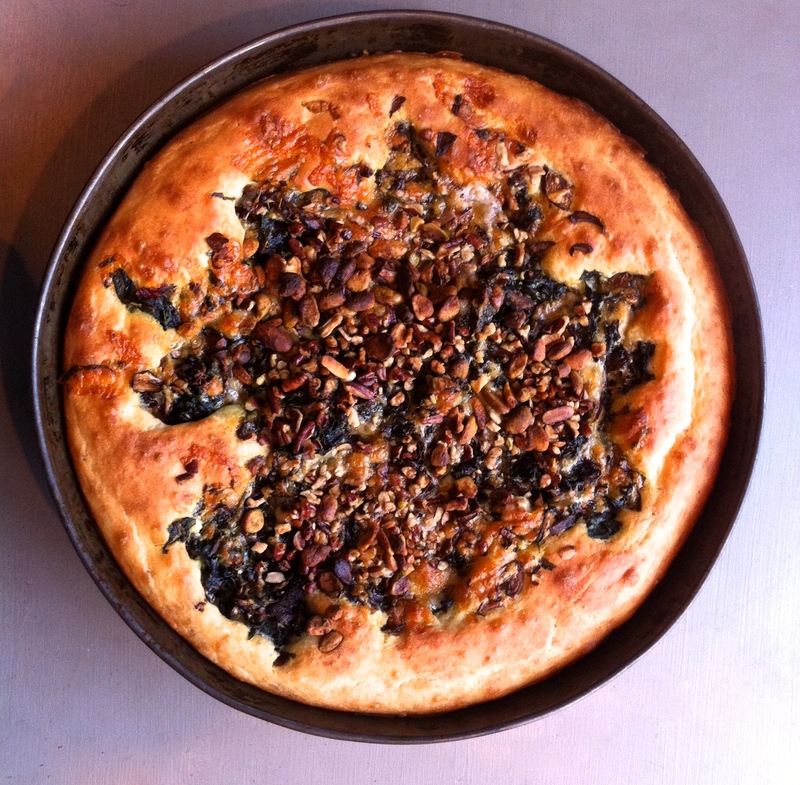 This entry was posted in basic pie filling, mushrooms, pie, recipe, Uncategorized and tagged brioche dough, pecan, pistachio, pizza, savory cake, stuffed brioche by Claire. Bookmark the permalink. The rag and bone man where we used to live when i was a teenager would chant “Any old lumber rag bone.” I’ll always remember that. Did he have a yard? A rag and bone yard? Did he live there? I’ve never seen anybody who actually called themselves a rag and bone man. What, like Steptoe and Son? I don’t know. But when we had to get rid of our piano (it had woodworm) he came and collected the metal inside bit which three of us had struggled to carry outside, and he picked it up and carried it away as though it had no weight at all. My oven doesn’t have a proof setting. The lowest it goes is 170 F. Is that too high? I think it might be. You can put the bowl on a radiator, if you have one. Or anywhere warmish. You might want to start by gently warming the milk and butter on the stove. That’s what I should have done, but I was feeling lazy. No, I don’t have an airing cupboard. I don’t think many people in America do. I’ve never seen one here. And I tried to find the actual temperature of an oven on proof. It seems to be about 85 F. Somebody suggested the top of the refrigerator as a warm place. And maybe safe from dogs and cats?